Earlier this year, Luciano Rahal got the chance to review Zoink’s Stick It To The Man! as it was finally launched on its final porting platform: the Nintendo Switch. 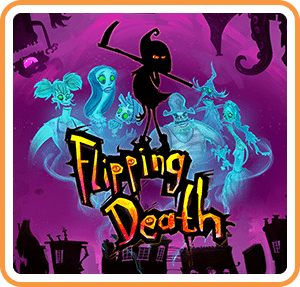 The Swedish studio is finally back with a brand-new IP, visually similar to their previous work, Flipping Death is a puzzle-platformer with some really fun gameplay mechanics that will rejoice fans of good ol’ LucasArts or Double Fine studio’s work. The story is one of Penny, which after a bad day at work and a car accident ends up falling to her death in a cemetery ditch of the town of Flatwood Peaks… Talk about bad luck huh? Now in the world of the dead, she is weirdly appointed as Death’s temp, so he can enjoy a long-deserved vacation. Given the traditional scythe, black robe, our heroine will meet and help the inhabitants of the world of the dead (the otherside) and the living thanks to some interesting skills. You soon discover that Penny can now move through the world the classical way such as jumping in a platformer game but with the added ability of teleportation. The latter is done via throwing your scythe to any spot in the world, allowing Penny to reach distant platforms. Penny can also collect three different kinds of spirits, which will be used as a currency to “possess” living people, thus read their thoughts, and influence them to do your bidding. This is where the game really begins, as it will be the core mechanics to solve numerous puzzles and riddles, to help one key character per chapter, as well as side objectives. The tone of the game is definitely wacky, but it’s adorably witty in terms of writing material. So at the core, Flipping Death wants you to solve problems for the characters you meet in order to solve a smaller part in a bigger riddle. At the beginning of the game, you will, for example, help an old sailor soul to finish painting his boat in blue in the world of the living, by finding the color itself, opening the can and then apply it, considering you can’t physically do anything there as Penny. The clues are in the possession of the living characters of course, which will give you a hint about how they could be helpful, and sometimes in the weirdest way. For example, you’ll be able to possess a chef that gets enraged by a bird and make use of his meatball gun to feed a Dachsund who happens to be stuck in the air by balloons, thus with the weight of the food consumed letting hum finally land. You’ll understand soon enough like it was the case with Stick It To The Man!, Flipping Death is a crazy story that will hook you up from the first lines of dialogue and riddles solved. A spiritual sequel to Stick It To The Man!, the new game uses the same graphical style, but this time with a ragdoll mechanics to move characters. Almost like a strange Tim Burton movie, Penny’s controls in the world of the dead is like a classic platformer, but it’s the extra gameplay mechanics that will break the routine of solving puzzles only. The soundtrack takes the jazzy tunes and influence from their previous work, which is a blast to our ears. Stick it to the Man was reviewed using a Nintendo Switch downloadable code provided by Zoink Games. The game is also available on PC, Xbox One and PlayStation 4 via digital store releases. We don’t discuss review scores with publishers or developers prior to the review being published (click here for more information about our review policy).